The best way to choose cheese at a cheese shop is to ask the fromager for advice. This is how I end up with new favorites all the time. Believe it or not, there are seasons for cheese, just like for fruit and vegetables. Recently, my cheesemonger recommended a Gour Noir. “It’s in season now,” he said. He went on to explain that goat cheese is usually best in the late spring and summer because that’s when the goats have their babies. I also learned that they graze in high mountain pastures at this time of year. Their more diverse diet (compared to wintertime) helps give the cheese more flavor and makes it creamier. So, what’s a Gour Noir? It’s a goat cheese made from raw goat’s milk with a charcoal-colored outside and a smooth, creamy inside. I like its original shape, that of a leaf. This particular cheese hasn’t been around for very long, only for a little over twenty years. 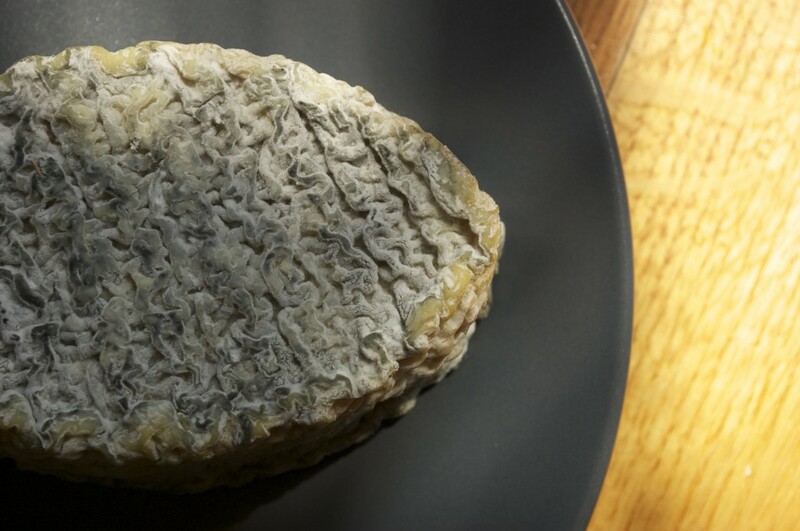 In the early 1990s, Monsieur Arnaud, a fromager from the Limousin region in central France, began making it. I had assumed it was called Gour Noir because of the color, but apparently, it was named after the hamlet where the Arnaud family lived, “Roc du Gour Noir.” And why is it black, I wondered? 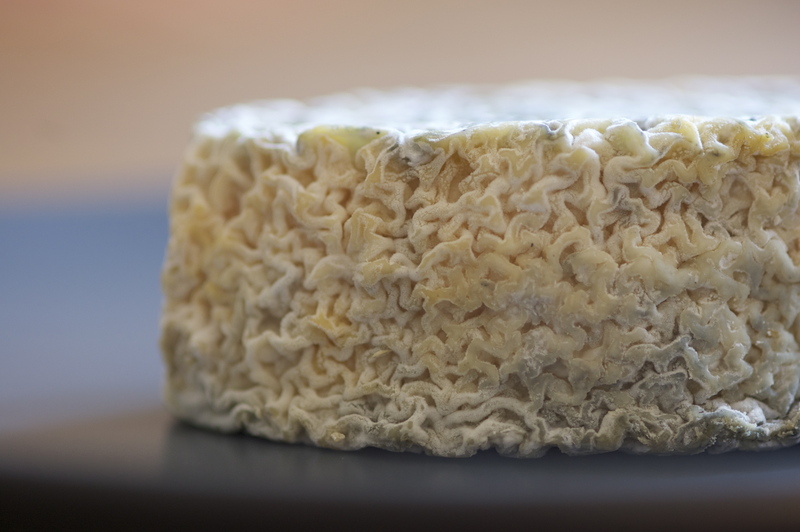 The unique color comes from the use of “sel cendré” during the cheese-making process. “Sel cendré” is a combination of salt and charcoal powder that is often used to salt French goat cheeses. This practice helps protect and preserve the cheese. We particularly like the Gour Noir, but can’t find it just anywhere. Under 200 pieces are produced per week and they’re for sale in specialty cheese shops around France. We get ours from the Fromagerie Beillevaire and have only eaten the younger, milder version. When aged a bit longer, this chèvre becomes stronger in taste and much drier in texture. Since I consider the Gour Noir to be the perfect dessert, it’s very unlikely that we’ll let it sit around that long. This entry was posted in What's a...?, Wine & Cheese and tagged appetizers, cheese, dessert. Bookmark the permalink. My mouth waters for the taste of good cheese. Do you have other favorites? Oh, how much do I want that cheese!! Despite the abundance of cows, sheep, and goats here in New Zealand, raw milk cheeses aren’t permitted, and so the cheese here is for the most part abysmal. It’s good for my cholesterol levels, but very sad for my cheese loving soul! Other favorites? Of course! Right now we’re into Brie de Meaux (a wonderfully creamy cheese from the town of Meaux in the Brie region of France). We’re also loving real Gruyère from Gruyère, Switzerland. I used it for a soufflé the other day and also enjoy it on picnics. Life without raw-milk cheese. I hear you, Val. Even in France, I wasn’t supposed to eat it when I was pregnant with Little Buddha. I missed cheese more than wine! Go easy on yourself, man! This is a HARD journey, and it’s a long process with a ton of ups and downs. I have hit so many plateaus, hard times, gains… I’m struggling some with food right now. It’s just the way it goes sometimes. Keep making the best choices you can, and you’ll get there. I’m officially addicted to reading your stories. I just signed up for the trial, and I’m going to explore your different features. One thing I think you need (and I’m sure you’ve thought of this), when I schedule a tweet, it’d be nice to have a Calendar popup instead of requiring me to type in the date and time.Keep up the great work! The both of us really enjoyed your post. It appears like you’ve put a lot of effort into your article and the human race need much more of these on the Net these days. I do not real have a large deal to say in retort, I just wanted to comment to tell well done. marvelous post. i never thought of that.